If you’re planning to stay in Hua Hin, make sure you stay at the best hotel in Hua Hin Thailand, the Novotel Hua Hin Cha Am Beach Resort & Spa. A very convenient location between Cha-am and Hua Hin, only 20 minutes away from downtown Hua Hin. This resort can be reached easily by private car or public minibus. We provide a full range of facilities starting with the rooms that are stylish and decorated in a contemporary, modern style. All rooms’ types are overlooking the beautiful ocean complete with private balconies. The room is full of 4-star amenities. Additionally, you don’t need to venture far for delightful cuisines, our best hotel in Hua Hin Thailand also has a restaurant and bar available every day. Start with an international breakfast buffet at Horizon 3rd floor and visit Le Café for coffee and pastry. Enjoy your evening having dinner by the sea while watching the sunset at Ocean Terrace or if you would like to indulge in some Thai fusion style food surrounded by a lotus pond, head to TAi restaurant. After dinner, visit the highest rooftop at Gravity Sky bar and enjoy the scenic views. Sports Fan? Don’t miss any of your favourite sports T.V show’s while enjoying your favourite beverage at Champions Sports Bar & Grill. 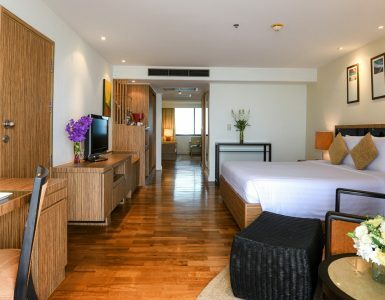 DON’T MISS OUT TO STAY AT THE BEST HOTEL IN HUA HIN THAILAND FOR YOUR HOLIDAY. WITH GREAT SERVICE AND FACILITIES FOR EVERYONE TO ENJOY. 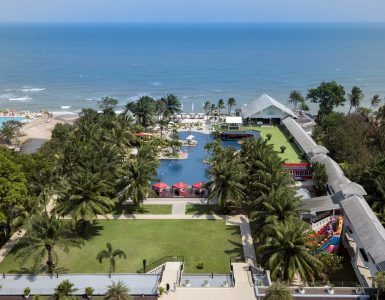 Best hotel in Hua Hin Thailand also has a spacious oceanfront swimming pool and water slide for children to play. Enjoy our pool bar serving sumptuous snacks and drinks during your swim. Children will spend their time enjoying entertainment specifically for kids at Kid’s World. We have a variety of activities such as the ball pit, painting, small theater and game consoles. You will not forget this wonderful moment at Novotel Hua Hin Cha Am Beach Resort & Spa.